And now my head shall be lifted up above my enemies all around me; Therefore I will offer sacrifices of joy in His tabernacle; I will sing, yes, I will sing praises to the Lord. Hannah cried out in anguish to God (1 Samuel). Honestly, it was hard to focus on anything with her rival’s taunting words invading her thoughts. Couldn’t she just get a break? Yet when she’d had enough – when she knew a decision must be made – Hannah excused herself from the dinner table where the family gathered. The resolve in her heart led her straight to God. As she prayed her most fervent prayer in the temple that day, God answered her. She would soon become a mother, her greatest dream fulfilled. A​ ​few​ ​years​ passed​ ​since​ ​she​ ​received​ ​her​ ​long-awaited​ ​promise. Hannah waited for the moment when she could visit the Tabernacle again, this time to offer praises to God for the victory. But when the moment finally arrived, she also faced the most difficult mom-decision ever. She had made a promise to God that she would dedicate Samuel to Him, permanently. How could she rejoice, knowing at the same time she would be handing him over to be raised by Eli the priest? Sometimes it feels like we move from one battle right to another with little reprieve in between. When one struggle is over, we settle in with an attitude of rejoicing for a day, then here comes the next struggle before we even get a chance to take a deep breath. 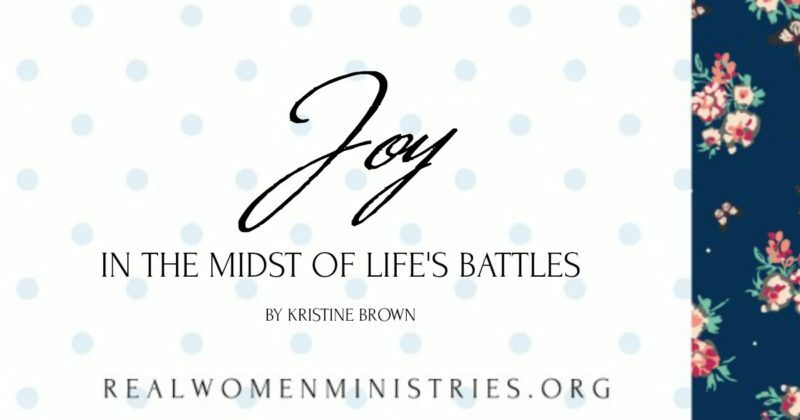 So how do we find joy to sustain us from one battle to the next? David’s words in Psalm 27 show us how to live in that place of joy every day. 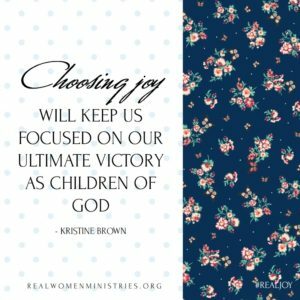 Choosing joy will keep us focused on our ultimate victory as children of God. When God answers a long-awaited prayer, I want to stay there a while. I long to put my feet up, sit back, and linger in His goodness. And when more challenges come calling before I’m good and ready, I’m tempted to hide under my blanket and hope they will pass on by. But the only way to ensure that joy will stay with me for the long haul is to remember this – God’s promises are long-term. He gave us a victory that lasts until the end of time. Hannah knew this. That’s why in the midst of moving from one battle to the next, Hannah chose to rejoice. Let’s be encouraged by Hannah’s example. Even though we may not see a bright spot right now, his glory shines from the beginning of creation until forever. That’s the kind of victory that deserves joyful praise, today and every day. Dear Heavenly Father, I rejoice today because I am Your child. I may face battles, but I know you lift my head above my enemies. I am thankful, Lord. Help me remember to choose joy, even when I am weary. Thank you for being our source of joy. In Jesus’ name, Amen. 1) Which of life’s battles leave you feeling weary and wounded today? What joy does it bring you to know that the war is already won? 2) How does walking in Christ’s victory impact the way you approach struggles and challenges in this life? Finding the joy and peace in life’s circumstances isn’t easy. I have dealt with my daughter for well over 30 years plus. Right now she is in an ICU unit fighting for her life. She overdosed on various drugs which this time came close to taking her life. She’s had several episodes which has led me to pray Lord she is so miserable why don’t you take her home. Sad isn’t it? I ask my self when will this be over. One doctor told me it’s over when it’s over. She has been in various treatment programs and nothing seems to work. Now I face the situation of when she is released what will be the next step. Her male friend said she can’t come there. So now what? I know the Lord knows the end result but I fight to keep above all of these tragedies. Linda, may I pray for you and your daughter right now? Dear Heavenly Father, please be with your child Linda and her daughter. It is so hard to feel joy and peace when we are watching a loved one suffer so much. We try to have the strength to keep helping, but we don’t know what to do or where to turn. We know that in those times, You call us to rest in You, trust in You, and cast our burdens on You. 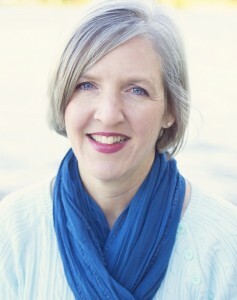 I pray for Your Peace that passes all understanding to fill Linda’s heart and spirit right now, Lord. I also pray for healing and restoration for her daughter. I pray she will discover her true identity in You alone, and she will begin taking steps toward a renewed life in Your son, Jesus. Thank you for your love and guidance for your precious daughters, Lord. In Jesus’ name, Amen. I will continue praying for you, Linda. Thank you so much for opening your heart and sharing with us here, dear one. Thank you for the reminder that God’s glory shines from the beginning of creation until forever. When God answers one of my prayers, I too, want to stay there forever and bask in that moment, but He continues to call us forward. Choosing joy allows us to move in step with Him. So thankful for your words and encouragement today. Blessings to you! Thank you for the simple reminder to rejoice in the hardships of our circumstances. Even thoughHannah’s tears flowed and her heart hurt she still released her son to Eli for a better good, choosing to rejoice. Such a different perspective on how we choose to walk through difficult times. Thankfully He does sustain and fill us when we meet with Him as the tears flow and heart hurts. Thank you for the reminder that God is steadfast and faithful in every part of our lives–most especially during the challenges and hardships. It’s perfectly normal to enjoy moments of celebration when things seem to go right and it’s important to press on when the going gets tough. God walks every step with us, hurts with us, and rejoices with us. I am thankful that regardless of my circumstances or situations I can choose JOY. This was a much needed reminder to choose joy in all circumstances. Thank you for the gift of truth!